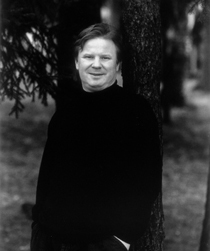 Jouni Kaipainen is a Finnish composer, journalist and writer who was born in 1956 in Helsinki. He studied at the Sibelius Academy with Aulis Sallinen from 1973–76 and Paavo Heininen from 1976–1980. In his works, Kaipainen employs classical forms to shape musical events, which are often of a narrative character. He allows his themes and subjects to breathe and develop, which at times lends an aura of Mahlerian Romanticism to his music. Sonority and melody are important parameters for Kaipainen, and these are explored within structures that derive from eighteenth century concepts of form. He seeks to arouse the curiosity of his listeners, to entice them with the strength of his imagination and to share with them the joy of seeking and finding new paths. His main works include Carpe Diem (for flute and orchestra, 1990), Symphony no. 3 (1999-2004) and Symphony no. 4 - Commedia (2010).